We are delighted to announce the arrival on the market of Cleveland Mews. 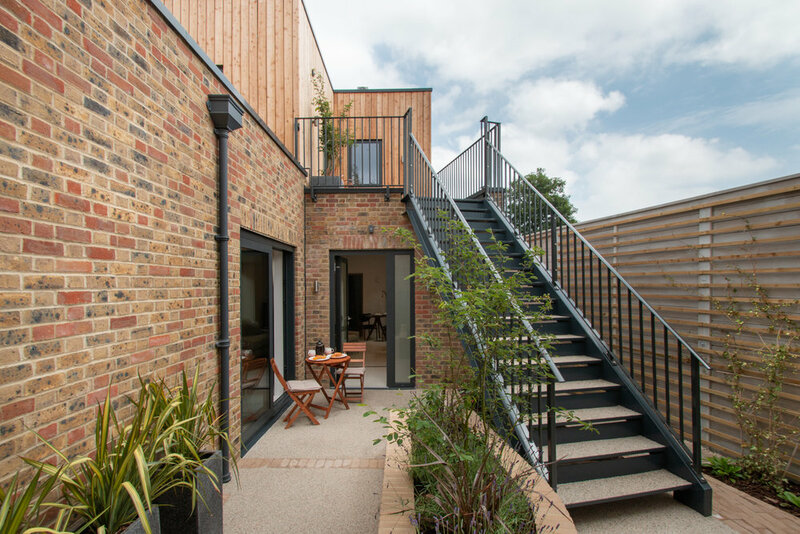 An elegant courtyard-style development, these six luxury apartments combine a contemporary design aesthetic with the latest in green technology, resulting in effortlessly sustainable homes. Situated a 5-minute walk from the picturesque city centre of Chichester, Cleveland Mews is an eco-conscious retreat in an urban context. With mature external landscaping and triple glazing these homes are somewhere to escape to. Yet the racecourses of Goodwood, the Minerva Festival Theatre and beautiful stretches of UK coastline are all less than a 20-minute journey away. Designed by award-winning architect firm Kirkland Fraser Moor, Cleveland Mews plays with the traditional vernacular of courtyard mews. Open plan living, high ceilings, and plentiful natural light create modern interiors, yet the courtyard layout creates stunning communal spaces that nod to English tradition. A superb two bedroom ground floor apartment. Apartment one has two double bedrooms, an en suite bathroom, shower room, an open plan living/kitchen space with a bespoke fitted kitchen, a parking space and beautiful private garden. A superb two bedroom ground floor apartment. Apartment two has two double bedrooms, an en suite bathroom, shower room, an open plan living/kitchen space with a bespoke fitted kitchen, a parking space and beautiful courtyard garden. A superb two bedroom ground floor apartment. Apartment three has two double bedrooms, an en suite bathroom, shower room, an open plan living/kitchen space with a bespoke fitted kitchen, a parking space and beautiful courtyard garden. A breath taking one bedroom first floor apartment. Apartment four has one bedroom, a shower room, an open plan living/kitchen space with a bespoke fitted kitchen, a parking space and roof terrace that enjoys and elevated position with a southerly aspect. A breath taking one bedroom first floor apartment. Apartment five has one bedroom, a shower room, an open plan living/kitchen space with a bespoke fitted kitchen, a parking space and roof terrace that enjoys and elevated position with a southerly aspect.